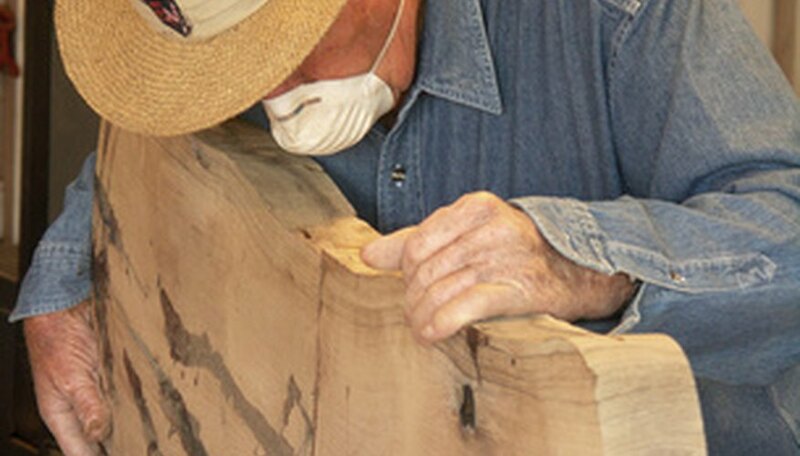 Scalloping a wood blank can turn it from a boring, ordinary piece of wood to an aesthetically pleasing work of art that can be used as decoration in or out of the house. The process takes some practice, a bit of perseverance and hard work, but the end result will make it worth the effort. There are a few different methods to use when scalloping wood, but here is a fairly basic one that is ideal for beginners. Set up an area in your garage or outside to scallop the wood. Make sure you choose a place where wood dust flying around will not bother you or others. Set the wood blank onto a level surface where you can hold it in place with your hands, or clamp it tightly to a work bench. Put on your goggles and dust mask. Gloves are also recommended to avoid splinters. Attach your flexible sanding disk to the angle grinder. Apply firm pressure to the wood blank with your angle grinder as you move it along the surface. Push the grinder simultaneously down and away from the work piece as you move it to create the scallops. How far apart and how large you make the scallops is up to you. Sand more and more off of the blank until you get a look that you are satisfied with.